Very little changes took place during the off week of the 34th Bata-the Sunday Times Most Popular Schoolboy Cricketer of the Year 2013 competition. Thurstan College’s Minhaj Jaleel strengthened his authority by a massive margin. The notable developments took place on the way to the 15th week of the competition is the entry of Chathuranga Rajapakse to the main competition and Chelaka Mallawarachchi toppling Davin Serasinghe to secure the third place in the International Schools category while the Emerging Schools category goes on to mature without any changes. Thurstanite Jaleel remains untouchable in the main competition with a tally of 19341 votes. As usual he has received 1315 votes during closed two weeks, while enjoying a substantial lead of 14653 votes from his immediate rival Dushan Hemantha. Hemantha, the skipper of St. Peter’s College Colombo sneaked into his present slot a few weeks back and by this time he leads third placed AK Tyron of Richmond College by 1008 votes. Trinity College skipper Dinuka Wickramanayake did not receive a single vote during the past two weeks but competitors behind him – Madawa Nimesh of Royal Panadura, Sachin Bulathsinhala of St. Anthony’s Katugastota, Jason Buultjens of St. Peter’s, Roshan Anuruddha of Gurukula Kelaniya, Damindu Ashan of Royal Panadura and Kusal Mendis of Prince of Wales’ – up to number 10 failed to threaten him in any way. 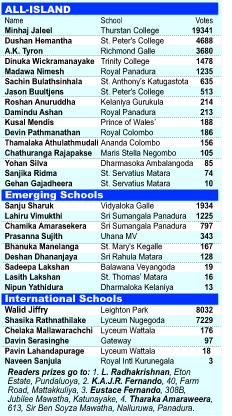 In the Emerging category Sanju Sharuk of Vidyaloka Vidyalaya Galle leads the way with 1934 votes but his closest rival, Lahiru Vimukthi of Sri Sumangala Panadura is making steady progress to press the leader. The deficit between Sharuk and Vimukthi is 709 but it anything can happen in the coming five weeks. Behind Vimukthi is his team mate Chamika Amarasekera who trails him by 428 with 797 votes. Others behind them are Prasanna Sujith of Uhana MV and Bhanuka Manelanga of St. Mary’s Kegalle. Walid Jiffry of Leighton Park who leads the International Schools category up to the 15th week is facing a threat ahead at the cost of his immediate competitor Shasika Rathnathilake of Lyceum Nugegoda. While Jiffry received 862 votes during the past two weeks Shasika built up his campaign by adding 1110 votes to trim down the deficit to 803. Davin Serasinghe of Gateway lost his place to Chelaka Mallawarachchi of Lyceum Wattala.